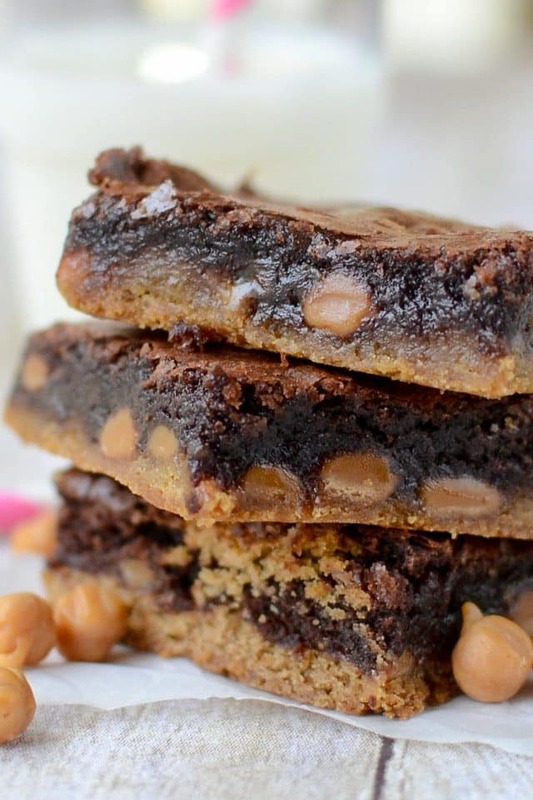 These Caramel Brownie Peanut Butter Cookie Bars are pure heaven! Caramel Brownie Peanut Butter Cookie Bars have a peanut butter cookie crust and a brownie top and are filled with caramel! Third Grade. The year I cut my hair short, which I’ve regretted ever since. The year I got my first crush. His name was Brandon and I loooooooved him. Mrs. McCarthy was my teacher. I learned cursive and how to add and subtract four digit numbers. We played lots of tag. Freeze tag, line tag, team tag. Melting candlestick in the witches corner tag (or something like that we made up). It was the first time (of many) that I was “phased out” of a group of girls. It was the year I got braces…the first time. Third grade is the first grade I really remember. Sure, I have glimpses of second grade: my teacher, sitting next to my BFF at our shared cubby desk. First grade…the teacher is fuzzy. All I remember of Kindergarten is playing statues on the carpet. It’s weird to think that Jordan has been out of third grade for 5 years now. I originally wrote this post when she was starting third grade…5 years ago. Back then hardly anyone read this blog so I’ve given this recipe a little facelift. 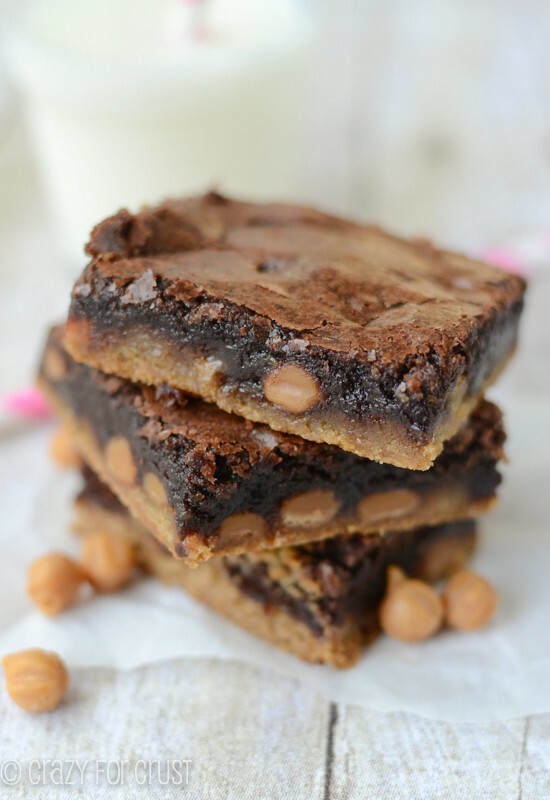 These Caramel Brownie Peanut Butter Cookie Bars are SO easy and are gooey and perfect. 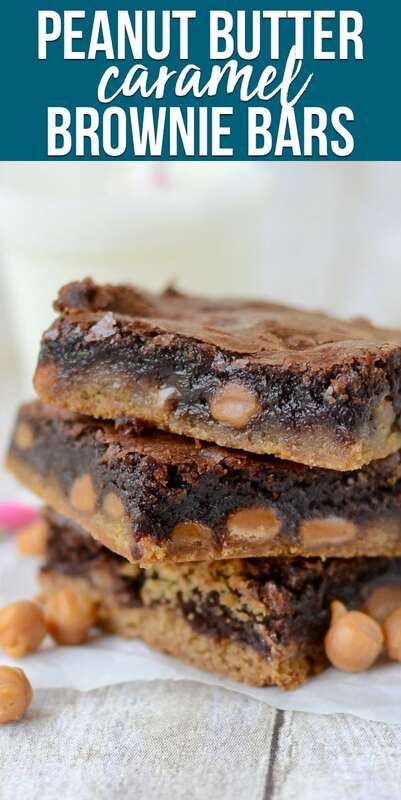 They’re brookies…with caramel. And they deserved another posting! These bars are seriously comforting. I made these after I had a week that just wouldn’t end. I made these bars on a whim at the end of a very long, tearful day. I saw Pillsbury peanut butter cookie dough in the refrigerator and I came across a box of brownie mix in my pantry. When reaching for the brownie mix, the caramel bits fell on my head, and boom. 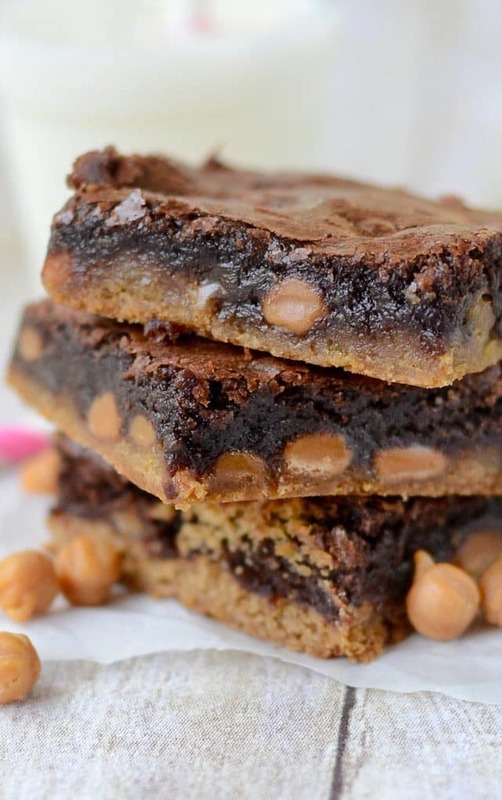 There’s nothing better than a gooey brookie, complete with chocolate AND peanut butter. These came together in minutes, were in the oven and being eaten in under an hour. I liked them best warm and gooey. But the next day (or the next…or the one after that) they’re good cold. Or heated in the microwave. These are the perfect comfort dessert. It’s a brownie and a cookie. I’ve made several versions: coconut brookies and mint brookies and oatmeal scotchie brookies. This recipe is by far the easiest: it starts with mixes. Sometimes you just need a day where everything works and is easy. That’s where mixes come into play! I used peanut butter cookie dough because it was what I had. You could use chocolate chip or sugar, or whatever sounds good. Don’t have caramel bits? That’s okay. Use M&Ms. Or chocolate chips…or whatever you like. I grabbed what I had on hand, and man, they did their job. I certainly felt better after a few of these. 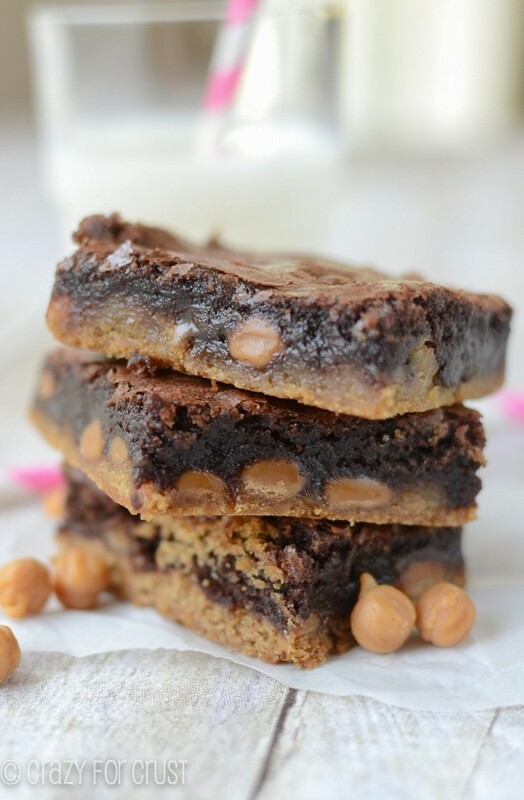 Caramel Brownie Peanut Butter Cookie Bars are a brookie with peanut butter cookies, brownies, and caramel. This recipe is easy to modify; don’t like peanut butter? Use chocolate chip cookie dough or sugar cookie dough. Use a from scratch peanut butter cookie recipe if you don’t want to use a refrigerated dough. Want from-scratch brownies? Use this recipe, or better yet, have my brownie mix on hand. Skip the caramel and use any candy you like! Preheat oven to 350°F. Line a 9×13” pan with foil and spray with cooking spray. Slice cookie dough roll into 1/4” thick slices. Press evenly into the bottom of the prepared pan. Sprinkle with caramel bits. Mix brownie mix according to package directions. Pour over caramel bits and spread carefully with a spatula. Bake for about 25-35 minutes, until a toothpick comes out clean along the edge of the brownies. You can eat these after they’ve cooled about 15 minutes in pan, but they won’t cut easily unless they’ve completely cooled. Use any flavor cookie dough and any candy in the center you want! 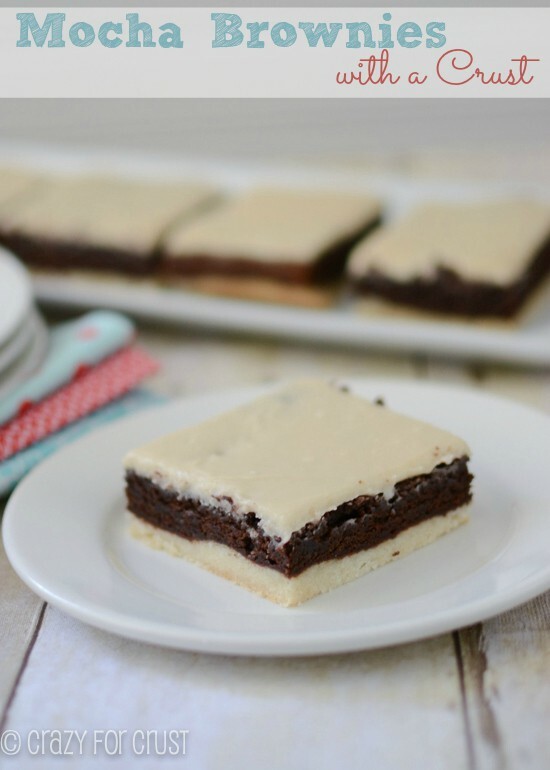 Mocha Brownies with a Crust – what, you haven’t had brownies with a crust??? Vegan Brownies don’t taste different, they’re just made without butter or eggs! 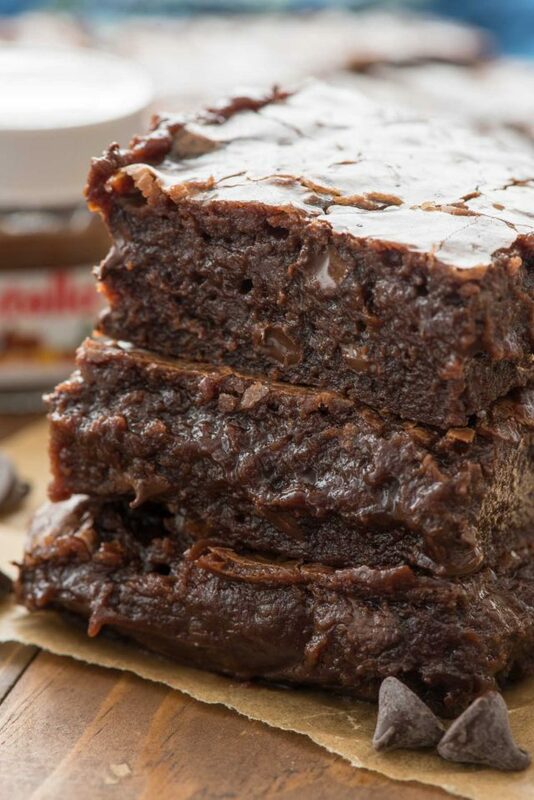 Nutella Brownies are one of my favorites! hi, i’m not reading something correctly. do you mix the caramel bits in with the brownie mix or do you pour the brownie mix over the cookie dough and then put the bits on top of the brownie mix.